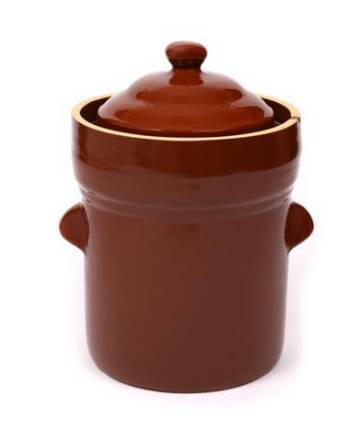 Brighten the fermentation process with our new light brown pot. This ceramic fermentation pot is hand crafted in the Boleslawiec Region of Poland. Each pot starts in the rich natural clay deposits in the area. The pots are cast in molds and fired at 2250° F. They are then finished with a lead and cadmium free glaze. The end product is dense, durable stoneware that is neutral to the fermentation process happening within. Our ceramic pots are perfect for preserving vegetables using lactic acid fermentation. This method of preservation has been known and used for centuries. The fermented vegetables are rich in taste and full of natural enzymes and vitamins. This fermentation pot uses a water collar at the top of the pot that eliminates contact with outside air. This seal streamlines traditional open pot methods and eliminates the growth of mold or yeast on the surface of the batch.